On the high plains of Qinghai province, where a massive earthquake killed hundreds on Wednesday, there was a grim realization that if not for the changing of the season, the devastation could have been much worse. In recent weeks many of the migrant herders in the region moved from their winter grounds, where they live in mud-brick houses, to summer pastures, where they live in tents, making it more likely they would survive the 7.1-magnitude quake. "Most have moved out of winter herding areas, so they won't be greatly impacted," says Marc Foggin, chief representative of Plateau Perspectives, an NGO in Qinghai's provincial capital Xining that focuses on sustainable development in China's mountainous west. That's the countryside. But even this remote western region hasn't avoided China's crush of urbanization, and Jiegu, the seat of Yushu County, was pummeled by the quake. As herders have moved off the land, towns like Jiegu have swollen, with workers living in quickly built apartment blocks on the outskirts. The urban area of Jiegu houses a population of about 100,000 and is expanding. More than 85% of the houses in Jiegu collapsed in the quake, according to the state-run Xinhua news service. The official death toll has reached 617, state media reported, with 313 missing and 9,110 injured. The quake, which struck the Tibetan plateau at 7:49 a.m., is one of the largest recorded in the immediate area, which is rife with seismic activity. The May 12, 2008, Sichuan earthquake, which killed 87,000, was centered about 375 miles (600 km) to the southeast of the Qinghai temblor. So far at least 11 schools have collapsed in Qinghai, and the number of dead students stands at 66, with dozens more trapped, provincial education secretary Wang Yubo said. Two years ago as many as 6,000 students died in collapsed classrooms in Sichuan. The anger of their parents, some of whom allege that official corruption led to flimsy construction, has been the most sensitive and painful legacy of that disaster. In Qinghai, the government is racing to save the lives of thousands of injured and homeless quake victims. Most aid to the disaster zone has been funneled over the 500 miles (800 km) of mountainous highway that links Yushu with Xining. The road is full of military trucks carrying aid and earthmoving equipment southwest and injured back to area hospitals. The Yushu airport, which was closed immediately following the quake, was reopened on Wednesday afternoon, and the People's Liberation Army flew in 110 rescuers from the China International Search and Rescue Team, Xinhua reported. Hundreds of police and firefighters as well as 1,600 troops have also been sent to the disaster zone. Vice Premier Hui Liangyu, who was dispatched to the disaster zone from Beijing, urged rescue personnel "to do everything possible to save people in distress," the Qinghai provincial government reported on its website. "You must fully believe that there are still people alive. Now, 24 hours after the earthquake, you must grasp this golden period to save people." While Beijing discouraged any efforts to investigate why so many schools collapsed in Sichuan two years ago, it did throw the might of the state into an aggressive rescue and rebuilding campaign in that province. The central government is following a similar path in Qinghai, sending a huge amount of resources to the remote mountain area. "The government does a finer job than many when it comes to crises," says Russell Leigh Moses, a Beijing-based political scholar. "The sort of centralizing impulses that have been the hallmark of the current leadership enables them to respond in a large way and quickly. It's very good at confronting a tragedy, and it's adept at cleaning up afterward. And it's also very quick to claim credit." In the past, the government's first response would more likely have been to downplay the extent of the disaster, as it initially did with the 1976 Tangshan earthquake, which killed 242,000, or more recently during the 2003 SARS outbreak. But in recent years, Beijing has emphasized a robust and more open approach to disaster management. "Crisis response has entered the set of things expected from government," says Björn Conrad, a researcher with the Berlin-based Global Public Policy Institute. "That's what you have to do to maintain legitimacy." State media has carried extensive reports of the rescue operations, but it has not yet hit the saturation coverage levels that followed the Sichuan earthquake. Some regional media outlets have been told by the Communist Party's Central Publicity Department to recall their reporters from the disaster zone in Qinghai, according to Chinese journalists familiar with the orders. The likely motivation is to limit coverage of collapsed schools or other politically sensitive aspects of the disaster. President Hu Jintao cut short a trip to South America to oversee the emergency response. 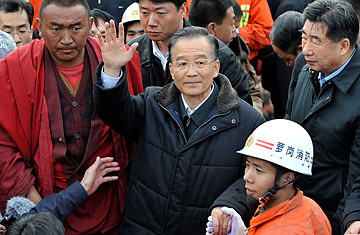 Premier Wen Jiabao flew to Qinghai on Thursday afternoon. "This is an extraordinary disaster," he told a crowd in Jiegu through a bullhorn as he stood by a pile of rubble. "The government and the State Council are very much concerned about the people here of all ethnic groups. Right now, our most important task is to save lives. More troops will be deployed. We will spare no effort as long as there is the faintest hope." The region is largely populated by Tibetans, many of whom distrust China's central government. In March 2008 hundreds of Tibetans rioted in the Tibetan capital of Lhasa, and the violence, which was directed at non-Tibetans, spread to other cities in the region. The Chinese government accuses the Dalai Lama of fomenting that outburst, a charge the exiled Tibetan spiritual leader denies. Many Tibetans say the violence was the result of discrimination they face in Chinese society. For the central government, a vigorous disaster response could help temper that distrust. In Qinghai, it is far too early for Beijing to claim any credit for relief efforts. The central government has pledged nearly $30 million in aid. More than a day after the rescue, local officials say they lack tents, medical equipment and doctors. The provincial government asked Foggin, whose NGO has operated in Yushu for nearly a decade and opened 11 village clinics in the area, to send help from Xining as quickly as possible. His organization has organized a website for donations (http://yushuearthquakerelief.com) and is dispatching teams to the disaster zone. "Basic supplies are in need, accommodation is in need, and of course there's the medical situation," he says. On Thursday afternoon Plateau Perspectives sent five people, including two doctors, overland to Yushu from Xining. With luck, they will make it by morning. Read "China Rushing Aid to Quake Survivors."